There are many places to shop in Vancouver. Some of them are listed below. Eaton’s is located at 701 Granville Street in the large Pacific Centre. This Centre includes over 200 stores. The PHONE NUMBER for Eatons is (604) 685-7112. Pacific Center has a variety of shops including Polo by Ralph Lauren, Tommy Hilfiger (a leading American men’s designer), Collections For Men, Leathers by London Fog, Dockers, Souvenirs of Vancouver, Chinaware and Crystal, Kitchen Essentials, Gourmet and Fine Foods, Oriental Rugs and many Factory Outlet Shops. The Bay . Not far from Pacific Centre is The Bay, Canada’s first department store. Near this store the Vancouver Centre Mall is located. Further down Georgia Street you can find the Royal Centre, a mix of over 50 shops and services. MetroTown Mall is located in Burnaby, a suburb of Vancouver. 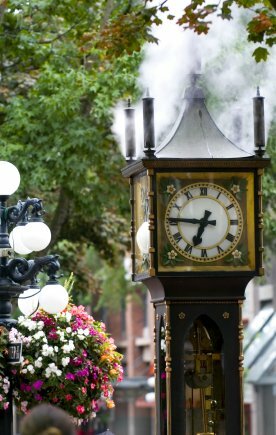 Gastown – besides being known for its shopping Gastown is where Vancouver was founded in 1867. Gastown was originally called Gassy’s, named after a saloon owner Gassy Jack Deighton. The town site was nicknamed Gastown or Gassy’s Town, never just Gassy’s. Most of Gastown was going to be torn down in the early 1970’s but citizens rallied their support and saved the area and now it is designated a heritage area. Cordova street in Gastown has small shops.